Division of Forestry and Wildlife | Don’t forget to show your support vote for Hawaii’s Wiliwili Tree into the Championship Round! Home » Announcements, featured » Don’t forget to show your support vote for Hawaii’s Wiliwili Tree into the Championship Round! Don’t forget to show your support vote for Hawaii’s Wiliwili Tree into the Championship Round! 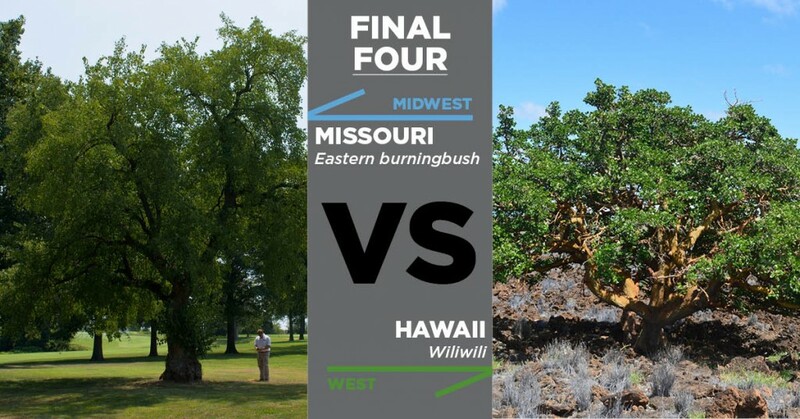 Hawaii’s Wiliwili has made it to the Final 4 and will be competing against Missouri’s Eastern Burningbush. Don’t forget to show your support and vote to move Hawaii into the Championship Round! Which tree deserves to win today’s matchup? The eastern burningbush in Missouri or Hawaii’s wiliwili? Vote now!